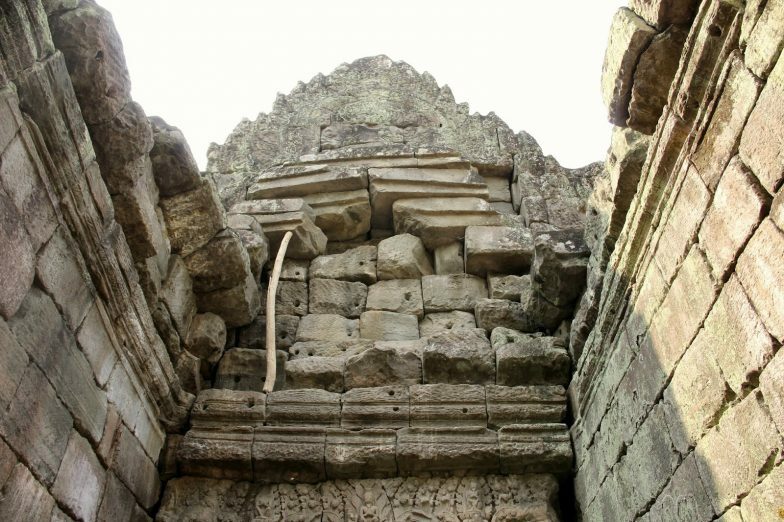 Yes, that tiny stick is holding up all of those stones (above). Scary! You could tell that our driver was used to taking people around on the circuit tours. I think we ended up combining the small circuit and grand circuit since we did Angkor Wat separately from Angkor Thom. Anyway, our next stop was Preah Khan! The entrance looked like a mini Angkor Thom gate, but it wasn’t nearly as busy. Yay! The Preah Khan candle is at the center of the temple. 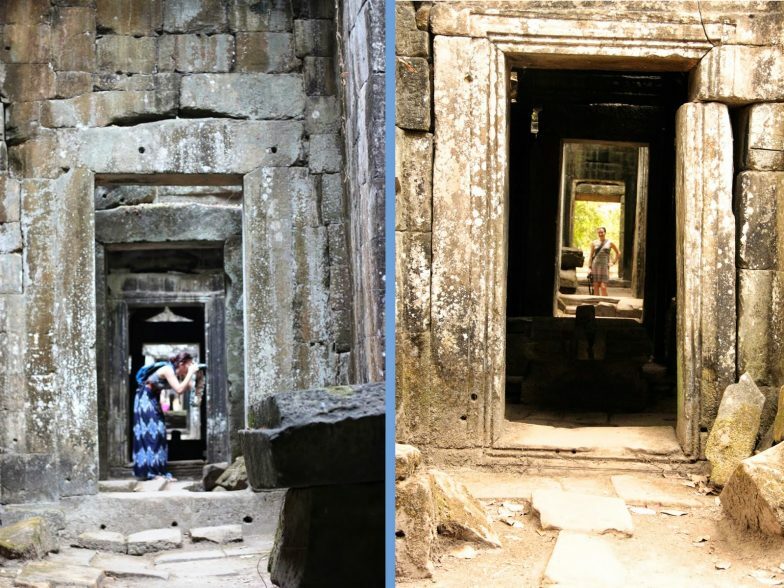 The midpoint, where we’re standing (below), used to be filled with all sorts of precious gems and each wall has a hole in it that aligns with the sun at different points during the day. This light appears to be a “flame” to the “candle” that rests in the middle. Can you imagine how beautiful it looked with rubies, emeralds, and everything else glimmerings? It was awesome to see, but it was ruined quickly when we got tricked into giving money to, what appeared to be, the security guard. So, be aware that they do not do things out of the kindness of their hearts! 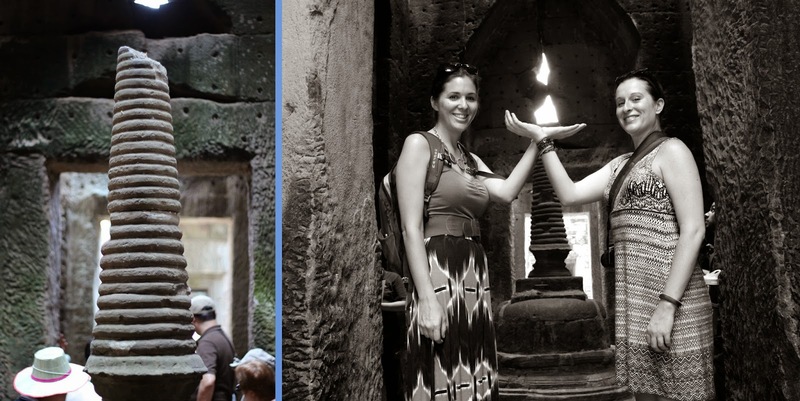 If you want a photo taken (we didn’t even ask, they offered – grrr) ask a tourist! The split photo has been my friend throughout this recap process & this is no exception. Can you spot wee-little Tabitha on the left (below)? This photo (below) was taken by our “Wat Fairy,” a little boy that popped up out of nowhere to try to get us to give him money for his school. After we made him read the letter to us (in English) and take our photo we gave him a few (5, I think) dollars. Then, we realized that all of the other foreigners had given him $20-40. Whoops! 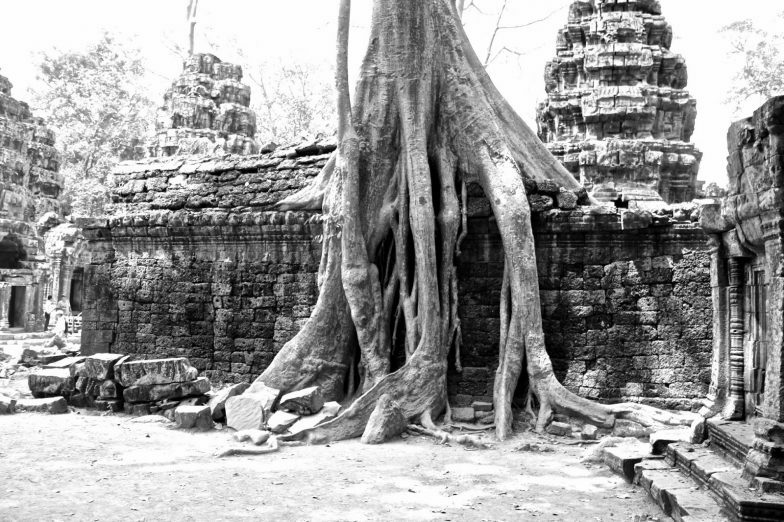 This (above photo) was another “iconic” moment for me because the strangler fig trees of Preah Khan are invasive and gigantic, a feature that I imagined all of the temples through Angkor would have. 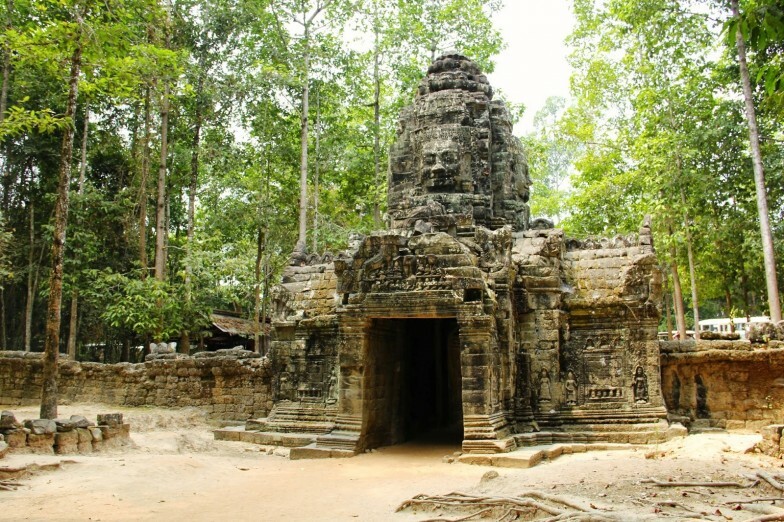 A lot of this temple has been left unrestored, but it’s still incredible and a must-see! 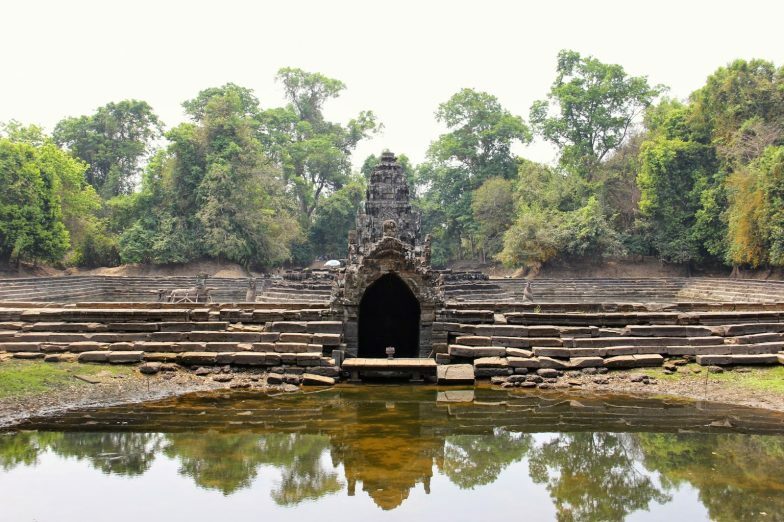 We stopped to see Neak Pean because, frankly, my sister’s guide book had a really beautiful photo and we wanted one! There isn’t much to see and we were only here for about 10 or 15 minutes, but it really is pretty. We took a moment to enjoy it and tried to ignore the construction crew and their umbrella in the background. Ha! 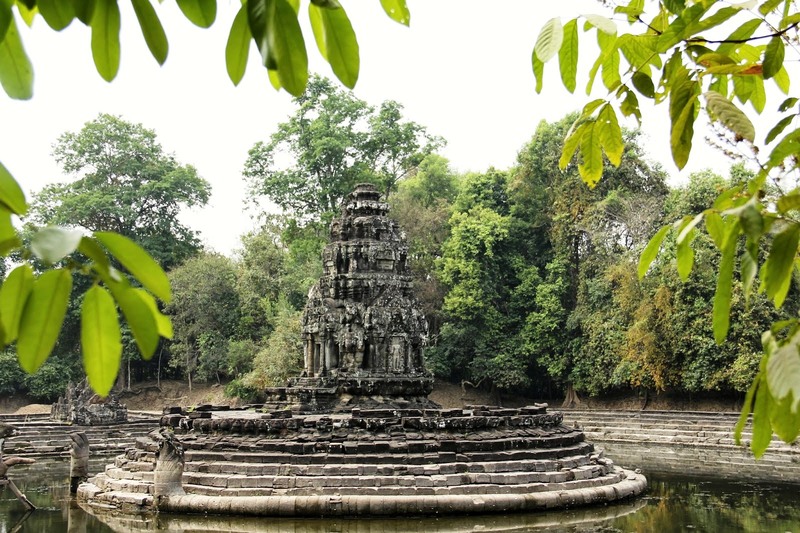 Following Neak Pean, we headed to Ta Som. 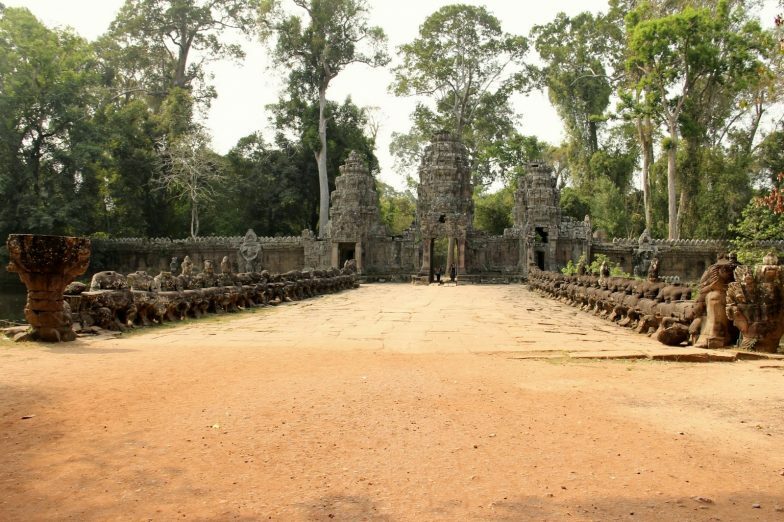 This temple is carved “Bayon style,” with many face carvings. 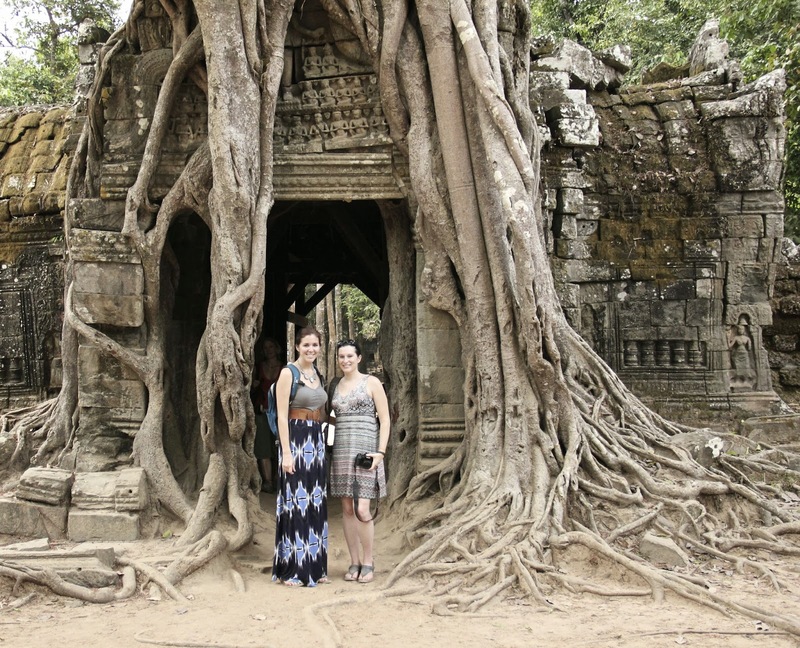 It was really pretty and my favorite part was the third eastern entryway that is consumed by a strangler fig. I just can’t believe how beautiful such destruction can be! 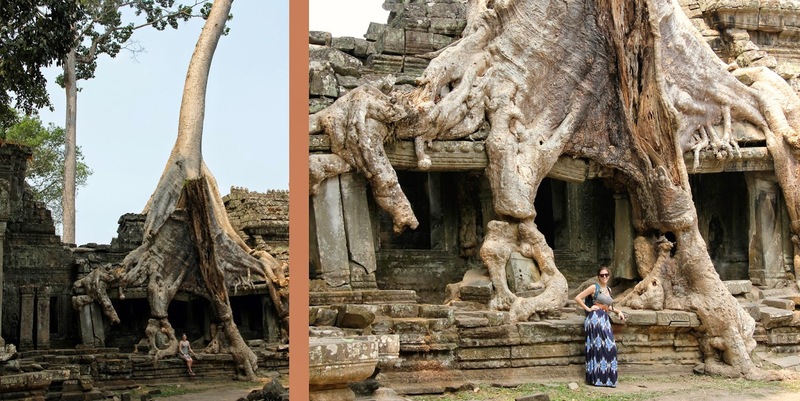 Also, how impressive is it that the tree literally grows through stone? It blows my mind, really! 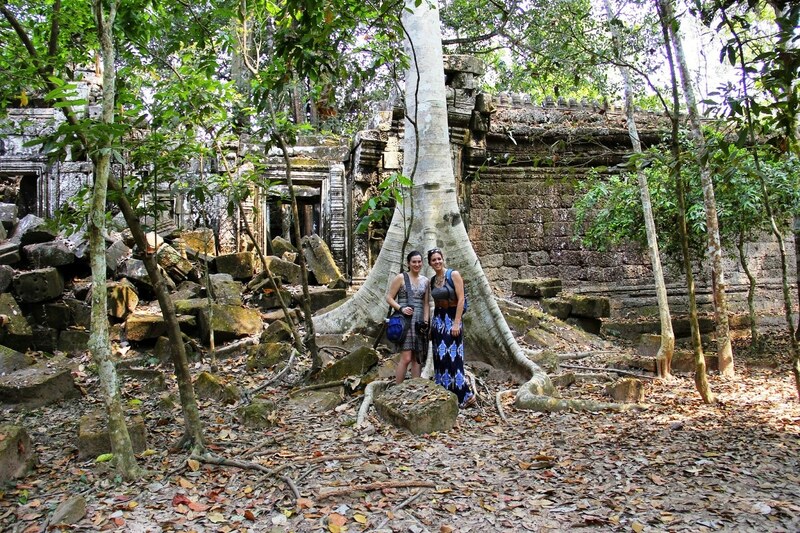 We stopped at Sras Srang and Banteay Kdei, but I wasn’t too impressed. This probably had a lot to do with me being “templed out,” but I have some pretty legit reasons, too. First of all, Sras Srang is just a small lake (or a big pond if your glass is half full). Seriously, just ride by it in a tuk-tuk and it has the same feeling as it does when you stop to look at it. 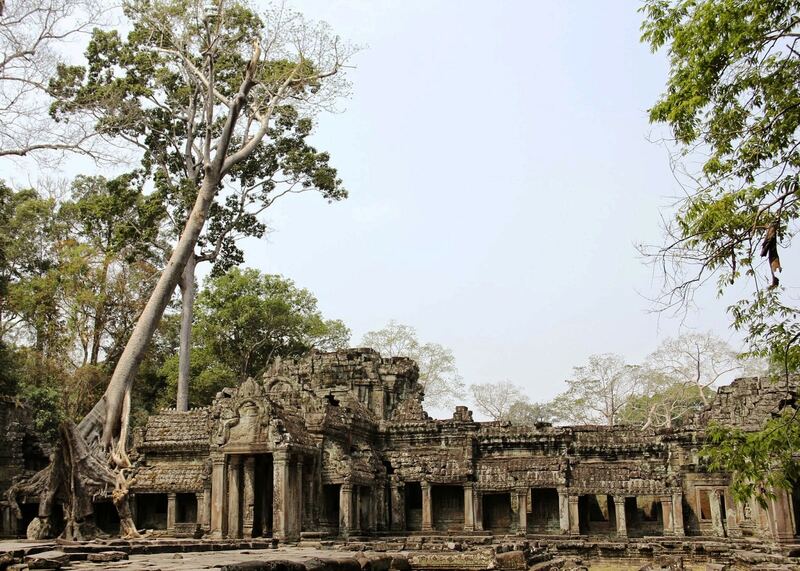 Banteay Kdei is beautiful, but it’s so broken down and destructed that there’s really not much to enjoy. It felt like we were just walking over piles and piles of rocks. Sad, but true. This (below photo), my friends, is Ta Prohm … also known as the Tomb Raider temple … also known as Indiana Jones’ temple … also known as my favorite temple in Cambodia! This is, clearly, a wat to see! 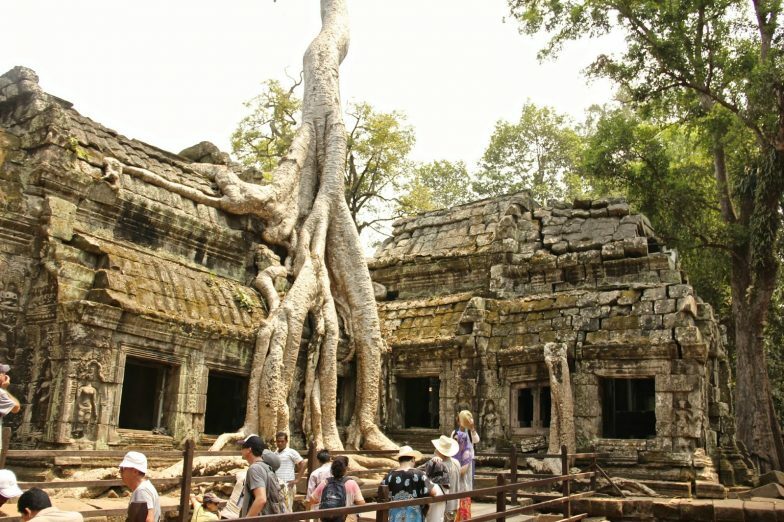 I knew about it’s “celebrity” before visiting it, but it is my favorite because it’s beautiful – not because it’s famous. Isn’t it so cool how the stone is just molded around the tree?! How does it do that without just knocking the entire thing over? 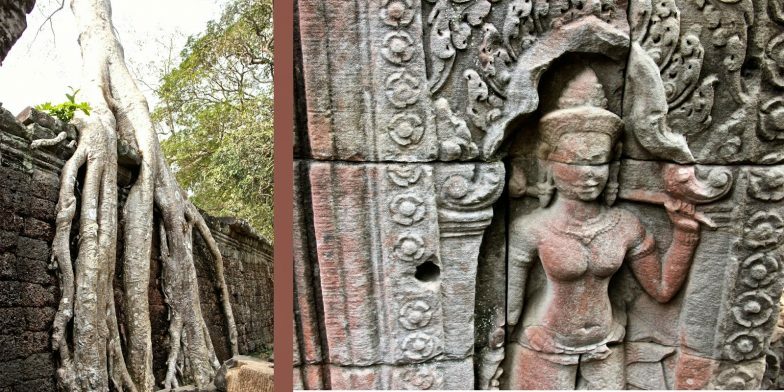 I know that it’s a concerning feature to those that work so hard to reconstruct the temples, but I find it to be a huge part of their history and character. My favorite, people, my FAVORITE! It was great way to end our day of touring. We were pretty tired of the stick-in-the-mud restaurants and had spotted the Foreign Correspondence Club during our bike ride, the day before, so we decided to give it a try. 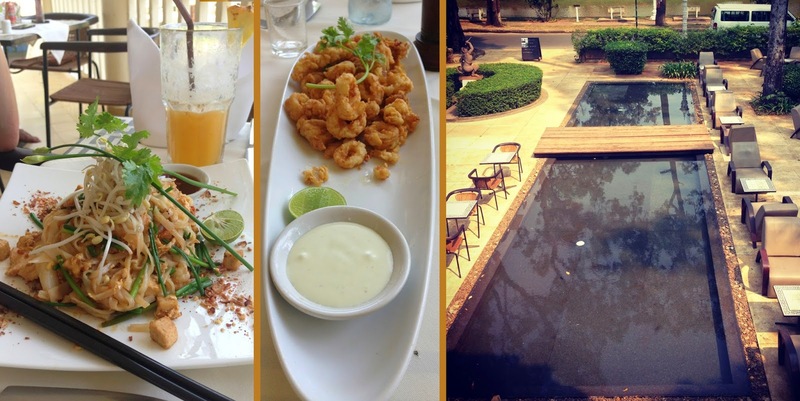 It was probably the most expensive lunch that we had in Cambodia (but not in Vietnam – more on that much later). We enjoyed the food, for sure, and my cocktail was fruity and refreshing (it was meant to be a smoothie, but I asked for a shot of rum). The service was mediocre, but we were happy to be sitting in the shade and relaxing. The day ended like most days in Siem Reap: by the pool with a cocktail … and all was right in the world.